The WLI for the week ending 7/30/10 will be released on 8/6/10. 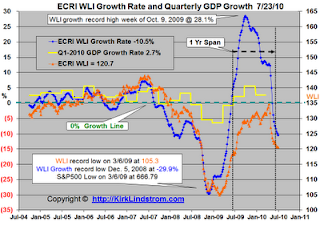 Before you claim understanding of ECRI's WLI, make sure you read the article "ECRI Weekly Leading Indicators Widely Misunderstood." "Bottom line, neither the “experts” predicting that the sky is falling based on the WLI, nor the other “experts” indulging in misinformed WLI-bashing in an effort to discredit the super-bears, have a real clue to what the WLI is all about... A slowdown in U.S. economic growth is imminent, but a new recession is not." Disclosure: I am long SPY (charts & quote) in my personal account and in the "Explore Portfolio" in "Kirk Lindstrom's Investment Letter." Subscribe NOW and get the July 2010 Issue for FREE! ! Your 1 year, 12 issue subscription will start with next month's issue. Despite the "Death Cross" in the S&P500, as of today we have heard of no change in ECRI's economic outlook of a slowdown without a double dip recession as we reported at ECRI Weekly Leading Indicators Widely Misunderstood. WLI growth fell to minus 10.5 percent from minus 9.8 percent a week ago, its lowest level since May 15, 2009, when it stood at minus 11.1 percent. 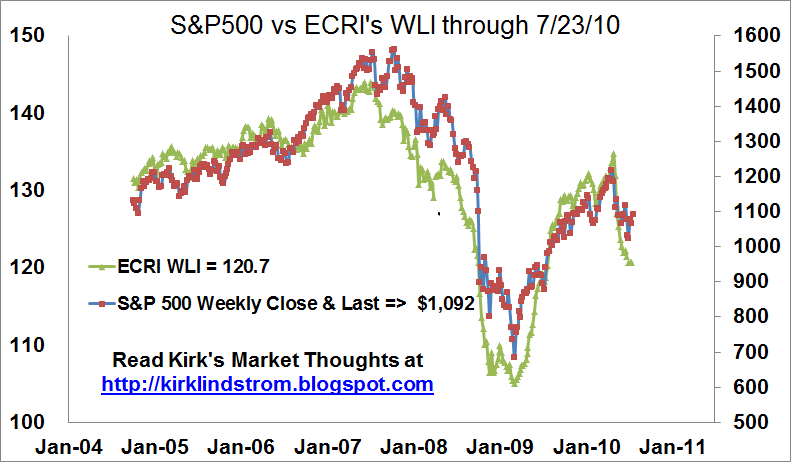 This is a chart of the S&P500 (charts + Quote) vs ECRI's WLI from October 1, 2004 through July 23, 2010. Which way do you think the Market and WLI will go? With the stock market up this week, the odds are good that WLI will be higher next Friday. vs. DJIA down 0.0% vs. S&P500 down 0.1%! 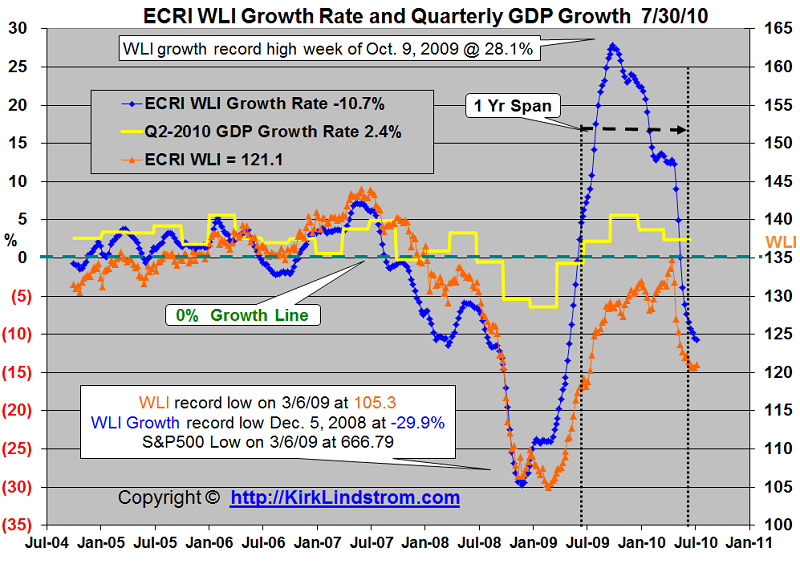 This is a chart of ECRI's WLI and WLI growth rate vs. GDP growth from October 1, 2004 through July 23, 2010. 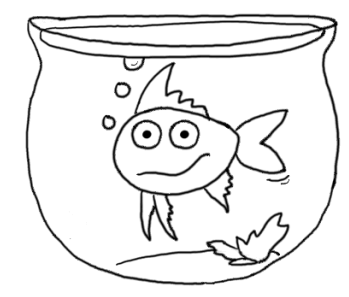 Note: The WLI for the week ending 7/23/10 will be released on 7/30/10. 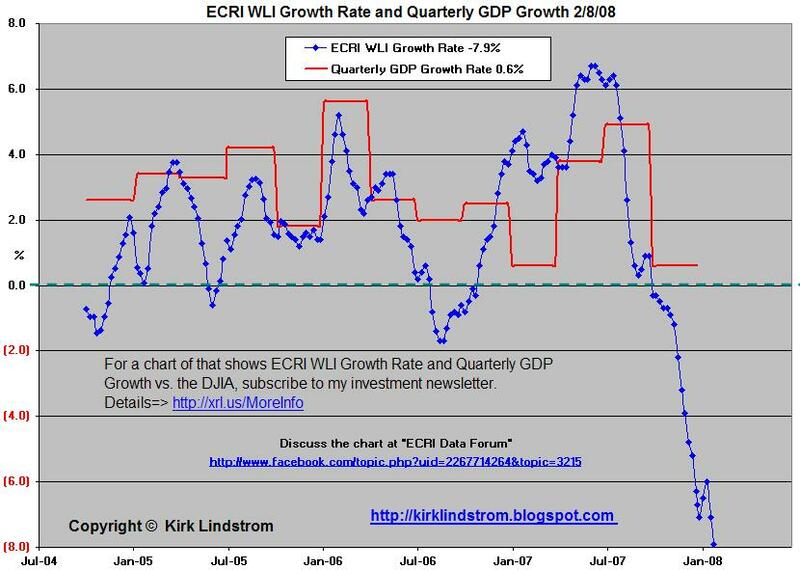 July 1, 2010: ECRI: Economic Slowdown Imminent but a New Recession is Not! Money continues to pour into bond funds. Annual data shown in table 1 below. 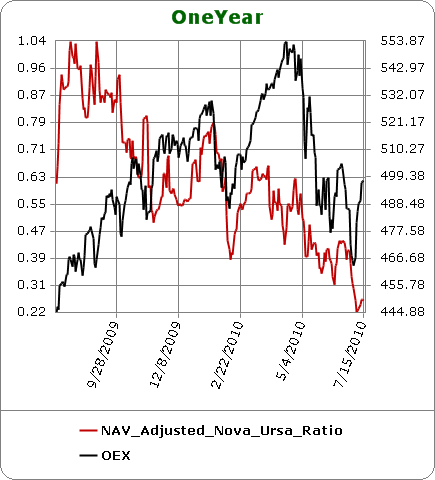 += Some data for Money Market Funds between March 2010 and July 14, 2010 is missing but the overall trend is clear. 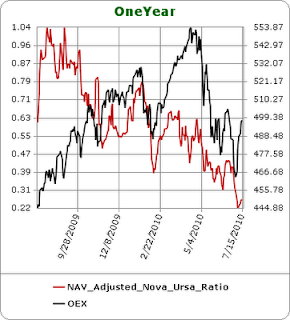 ExETFs—For the week ended 7/14/2010 all Equity funds report net inflows totaling $0.117 billion as Domestic Equity funds report net outflows of $0.007 billion and Non-Domestic Equity funds report net inflows of $0.124 billion... ExETFs—Emerging Markets Equity funds report net inflows of $0.186 billion as investors continue to look outside the US and developed European markets… Net inflows are reported for All Taxable Bond funds (+$6.205 billion), bringing the rate of inflows of the $1.098-trillion sector to $3.351 billion/week... International & Global Debt funds ($0.628 billion) continued to draw assets as they reported inflows for the seventh consecutive week... Net inflows of $2.104 billion were reported for Corp-Investment Grade funds... Money Market funds report net inflows of $2.853 billion... ExETFs—Municipal Bond funds report net inflows of $0.612 billion.... The database was updated a second time today to reflect a large batch of fund mergers during the week, which originally overstated Municipal Bond funds flows. vs. DJIA down 0.7% vs. S&P500 down 0.7%! The top CD annal percentage yield (APY) this week is at Pentagon Federal Credit Union for a 7-year certificate of deposit currently paying 3.51%. From my survey of six months ago, this same certificate was paying 4.5%! On Friday July 2, 2010 the chart of the S&P500 made a bearish "death cross" where its 50-day moving average, MA(50) broke below its 200-day moving average MA(200). This "death cross" for the S&P500, last occurred between the 50- and 200-day moving averages in December 2007, shortly after the beginning of the market decline that eventually took the S&P 500 to 12-year lows in March 2009. One of the simplest trend following models says BUY when the S&P500 makes a "golden cross" where the 50 DMA crosses above its 200 DMA then SELL when the "death cross" occurs. This model worked well the last time there was a death cross. WARNING: Not all death crosses signal a new bear market and some occurred after the bottom was made. Another problem with this sort of "system" is markets that are range bound can give many signals so you end up selling low and buying high over and over. For example, the death cross system missed the 1987 bear market, went to cash near the lows but after the bottom in 1987, got back in at a higher level in mid 1988 then lost more ground to "buy and hold" through whip-saw action between 1990 and 1991. To some Wall Street economists, it may seem self-evident that there should be strong demand for their views. But this is not at all clear to us as far as their recession-forecasting function is concerned. After all, a 63-country IMF study on economists’ recession-forecasting prowess concluded that “The record of failure to predict recessions is virtually unblemished.” In contrast, the IMF subsequently noted that ECRI “has actually had a very stellar record” of recession forecasting. As we outlined in our 2004 book, Beating the Business Cycle, there is no Holy Grail of economic forecasting, even among our large array of state-of-the-art leading indexes, of which the WLI is but one. It seems that many of the self-styled experts on the WLI either haven’t read the book, or simply don’t understand the parts of the book where we repeatedly state, in no uncertain terms, that ECRI does not use models. They just don’t get it. While this may be a valid criticism of statistical models of the economy, ECRI’s leading indexes are not, in any sense, statistical models of the economy. BofA’s ignorance of the facts continues in their use of a 1993 (yes, 1993!) Dallas Fed study of the Commerce Department’s LEI to impugn the WLI. The Fed paper correctly points out that the-then LEI got revised a lot — a situation that hasn’t changed now that the Conference Board maintains the index. However, none of what the Fed reviewed in 1993 had anything to do with the WLI, which is the target of the current BofA report. Furthermore (not that we’re fans of the Conference Board’s LEI) but the Dallas Fed study may not be valid in the first place, since the results are based on a Bayesian model chosen by the Dallas Fed to generate recession and recovery signals from the LEI. In other words, it isn’t clear whether failures highlighted in that report have to do with the LEI itself or the assumptions and the specifications of the Bayesian model used in that study. BofA’s parroting of our forecast from late last summer reminds us of Jon Stewart’s segment on Nowcasting where experts describe something that’s already happening as though it’s coming (Jason Jones starts at three-minute mark). 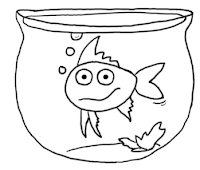 Bottom line, neither the “experts” predicting that the sky is falling based on the WLI, nor the other “experts” indulging in misinformed WLI-bashing in an effort to discredit the super-bears, have a real clue to what the WLI is all about. We created the WLI not to be an infallible, stand-alone recession-forecasting machine, but as one small part of a much larger array of leading indexes (each made up of many economic indicators) — like the especially prescient U.S. Long Leading Index. This array amounts to a sophisticated sequential signaling system of the economy’s cyclical turning points. The WLI is designed to be interpreted in this broader context, and its message today is quite simple: A slowdown in U.S. economic growth is imminent, but a new recession is not. Of the Major indexes, the S&P500 had the worst first half with a 7.6% loss while the Russell 2000 "only" lost 2.5%. 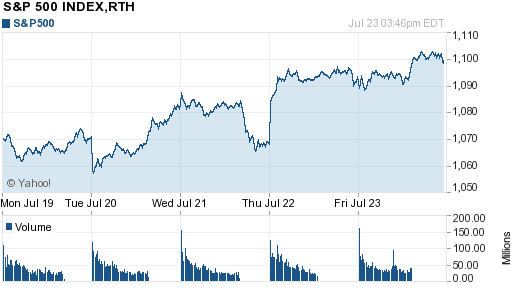 The Dow Jones Industrial Average or "DOW" is down 6.3% YTD. 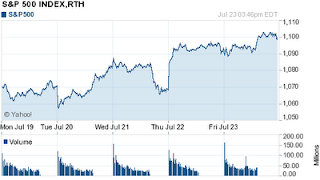 With a year-to-date (YTD) gain of 15.9%, Boeing (BA) was the best performing stock in the DOW. Alcoa (AA) is at the bottom of the list with a YTD loss of 37.6%. The following table ranks the performance of the 30 DOW stocks from best to worst. Note, Price Performance does not include dividends. Disclosure: My personal portfolio is currently long GE, HPQ, INTC, IBM, MSFT & PFE. Also, the "Explore portfolio" in "Kirk Lindstrom's Investment Letter" is currently long GE, INTC, IBM,M SFT & PFE.